ST. PETERSBURG, Fla. — Baristas love Mother Nature as much as they love their loyal customers at the quirky Black Crow Coffee Co . 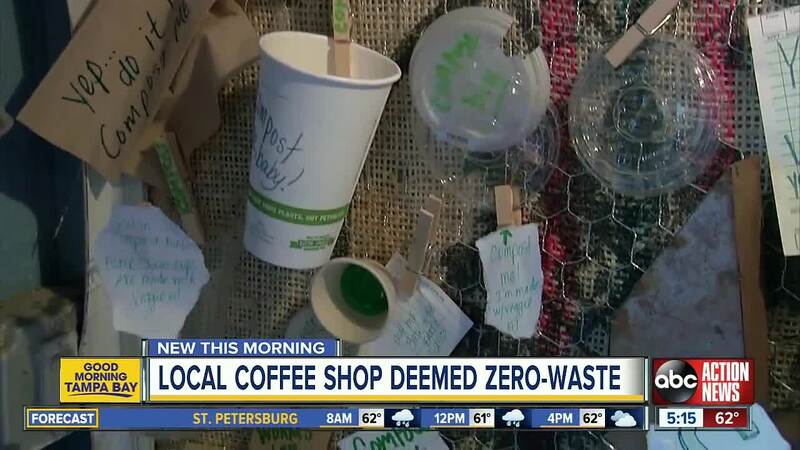 The hangout in St. Petersburg's Old Northeast neighborhood is the first coffee shop in Florida to be deemed “zero waste” by the environmental company Suncoast Compost . The designation means 90 percent of the shop’s waste is kept out of Pinellas County landfills. Black Crow uses organic and biodegradable cups, sleeves and coffee bags. Everything is compostable. Customers are urged not only to forgo lids, but to bring in their own cups and to-go containers to cut down on waste. One corner of the cozy shop is dedicated to all the things they compost and how customers can help the environment. “Worms love us!” one sign reads.